Nokia 1 is the first Android Go phone from a major manufacturer and it’s expected to be priced at around $85-90 or approximately Rs 5,000. “We’ve led the development of the Google Android Oreo Go Edition, which is a purpose-built solution for this segment. What Google has done there is to optimize, whether it’s the application or the operating system to run on what’s accessible. It’s actually a really fluid user experience,” Juho Sarvikas, HMD Global’s Chief Product Officer, said. As expected the Nokia 1 has pretty basic specifications, which include a 4.5-inch display with an SD resolution of 480×854 pixels, plus the MediaTek MT6737M chipset which features a quad-core CPU clocked at 1.1 GHz and 1GB of RAM, along with 4G connectivity. On the back is 5 megapixel camera, coupled with an LED flash, while you have a 2 megapixel front camera for selfies and video chats. As you might expect, the internal storage is limited to 8GB, but there is a microSD card slot that can take in up to 128 GB of external storage. Finally, there’s a 2,150 mAh battery, which does sound plenty considering the low specs. Of course the specs are only one part of the story, as Nokia 1 will be powered by Android Oreo Go Edition, which will come with optimized Go apps for a number of Google products, including YouTube, Gmail, Gboard, Assistant and more. HMD refreshed its popular Nokia 6 model for 2018 and this brings some serious new hardware chops such as an upgraded Snapdragon 630 SoC, as opposed to the Snapdragon 430 in the 2017 model. 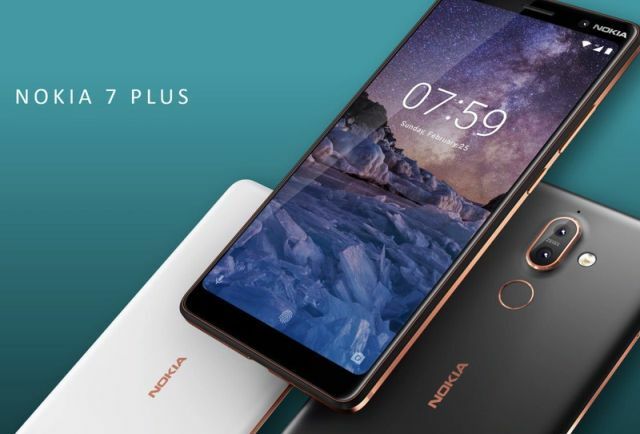 This change means the Nokia 6 now gets USB Type-C support, as well as dual cameras which proved to be a big hit among Nokia 7 and 8 users. Nokia claims an 80 percent CPU performance improvement, a 60 percent graphics improvement for improved gaming on the phone. It also gets upgraded Cat 4 LTE radios, which should offer great upload and download speeds of 150Mbps and 50Mbps respectively. The improvements are also very apparent when looking at the 5.5-inch display which is incredibly bright according to Nokia’s listed specs of 450 nits. Despite that, the fast-charging 3,000mAh battery (up to 50 percent after 30 minutes of charging) should provide ample battery life. On the back, there’s a 16-megapixel dual-lens main camera unit with 1.4 micron pixels, an f/1.7 lens with Zeiss branding, and the usual wide and telephoto lens setup, for improved zoom performance or wide shots. 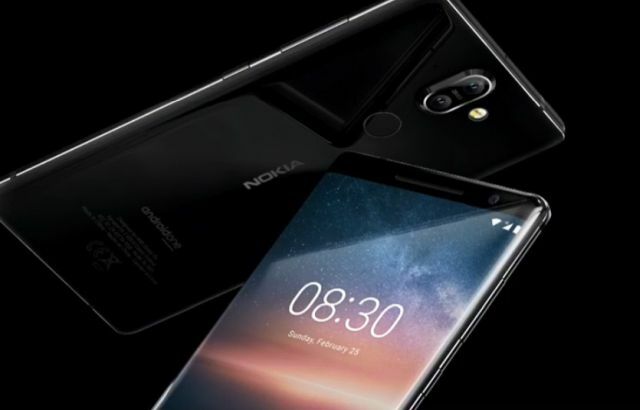 The front features an 8-megapixel selfie and video call camera, which Nokia says can detect low-light environment and combine four pixels into one super-pixel for better night selfies. The New Nokia 6 will go on sale in early April, according to HMD, with a 3GB RAM/32GB storage one costing around $340 along with a more expensive 4GB RAM/64GB version. Nokia’s 7 Plus is the bigger brother to the New Nokia 6, but has the same DNA. It comes with a much larger 6-inch 2220×1080 pixel resolution display and a modern 18:9 aspect ratio. It also gets better cameras – a 12-megapixel wide aperture sensor and a 13-megapixel telephoto lens on the back, plus a 16-megapixel camera on the front. Both have the familiar Zeiss branding and optics. Just like the New Nokia 6, this one will be powered by the Snapdragon 660 CPU, come with 4GB of LP DDR4 RAM, and 64GB of storage (can be expanded via microSD, officially up to 256GB). The Nokia 7 Plus, though, gets the better Cat 6 LTE antenna, which gives you up to 300Mbps and 50Mbps in speeds for downloads and uploads, if your network supports it. Another stand-out specs element is the big 3,800mAh battery unit. Nokia says it will last 26 and 14.5 hours for audio and video playback respectively. This one too will be available by April and for around $490. Finally, it was time for the new flagship. The Nokia 8 Sirocco is easily the most powerful phone in HMD’s stable with a Snapdragon 835 SoC, along with 6GB of RAM and 128GB of storage This is also the first Nokia-branded smartphone to drop the headphone jack, so Nokia has jumped on the wireless headphones bandwagon. The Nokia 8 Sirocco has a stainless steel and glass construction – a vacuum-formed layer of Corning Gorilla Glass 5 wraps around the sides of the phone. Nokia says it’s more than twice as durable as phones with aluminum bodies. Plus it’s also IP67-rated for ingress protection against dust, spills, and everyday wear. Up front is a 5.5-inch 2K or 2560×1440) OLED display with the more traditional 16:9 aspect ratio. Thanks to the glass back, Qi wireless charging is supported, and the phone has a 3,260mAh battery. Nokia claims it can be charged up to 30 minutes via Fast Charge through the Type-C port. which will also be used for USB headphones or your #donglelife. The dual cameras on the back are also Zeiss-branded like all of Nokia’s high-end phones – a 12-megapixel main sensor is combined with a 13-megapixel telephoto lens for 2x lossless zoom. The front camera though is just 5-megapixels which could disappoint selfie maniacs. Since this is a premium device, the pricing is expected to be in line with iPhones and Google Pixels. 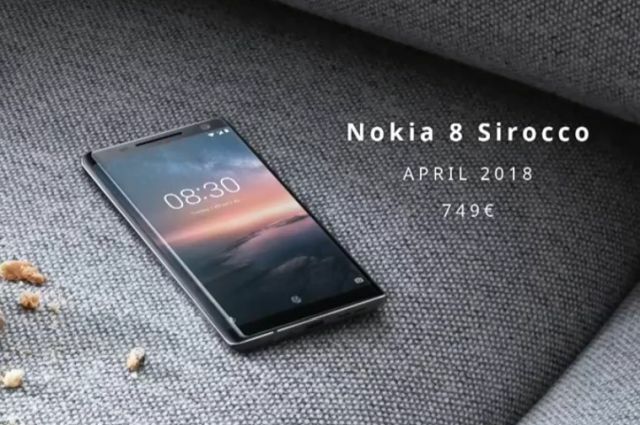 Nokia 8 Sirocco is expected to be priced $900-plus, though this will be confirmed closer to its availability in April. 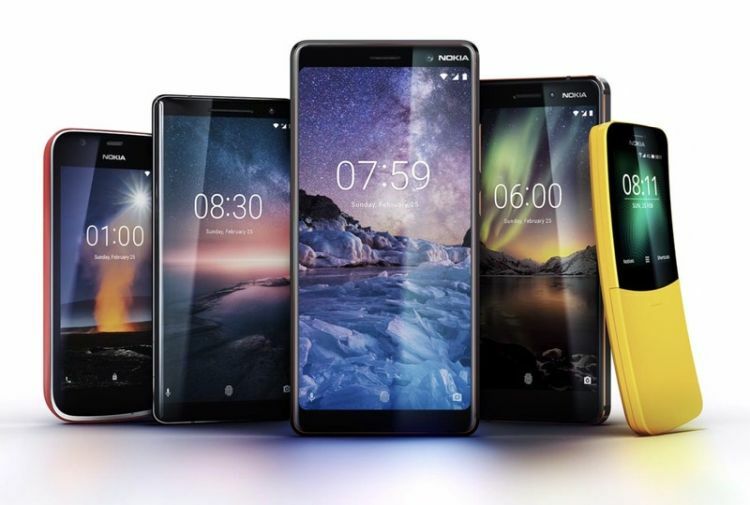 In addition to these new phones, HMD announced that all Nokia phones will be moving to Android One program, which means improved software updates and tech support for a period of up to 3 years. This is a great new feature for Nokia phones, and another reason why the brand is making a strong comeback in the market. We can’t wait to get our hands on the new Nokia phones later this year and see what HMD has done to bolster its repertoire.